One day while browsing Instagram, I stumbled across a post about Dressember. I had never heard about it before so I read up on it. 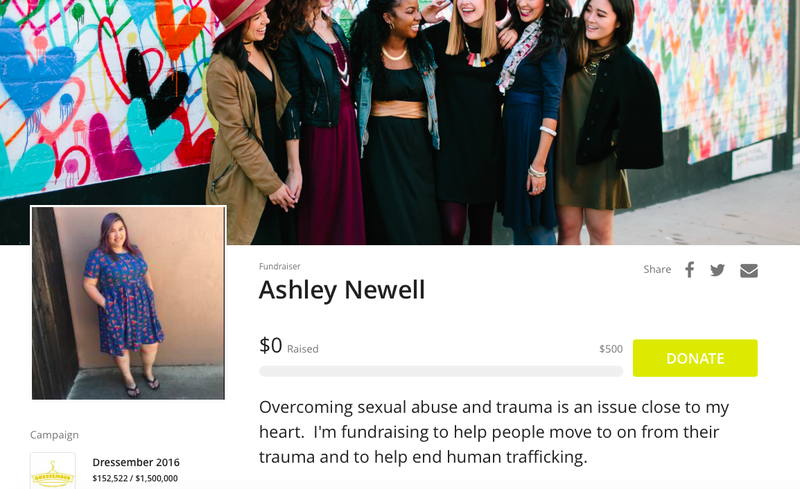 Dressember is fundraiser where women commit to wear a dress (men wear bow ties or fancy dress clothes) every day for the month of December to raise money to end human trafficking. I let it go for a few days but it kept coming back into my mind. Then I watched the TEDx video from founder of Dressember, Blythe Hill (posted on Dressember.org) and it solidified that I NEEDED to do Dressember. In the TED Talk, Blythe talks about sexual abuse and how she felt afterwards. How she felt like maybe she didn't matter because of what happened to her. She applied this to the 35 MILLION people who are being held in slavery today, women and children being sold like they are products. My heart breaks for them. Not just because it's horrifically sad but because I remember that feeling of hurt, anger, insecurity, pain, worthlessness, depression, loss, and so many other awful emotions. Then living with all this emotional damage for years, probably decades even after the physical part is over. Powerless. I have advocated for so many people, different causes, but never have I fundraised for something so close to my heart. Dressember is a little terrifying. Wearing a dress accentuates your femininity which is something I pushed a side for a long time. But I'm in a place where I have a tiny bit of influence and I NEED to use that for good. And talk about things that are hard to talk about. And speak for people who don't have a voice.